Most dog owners might concur that there is no better exercise program than the endless trips to the door made to accommodate a canine's need to use the bathroom. 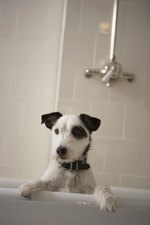 Dogs often confuse bathroom time with play-time, but with some training, and a couple of bells purchased at a craft store, you can have your dog ringing the bathroom bell with all the fervor he'd display when the dinner bell chimes. Prior to teaching your dog to ring a bell to go outside, it's necessary for him to have basic potty training skills. If your dog has a preference for tinkling behind the sofa, you may have some work to do prior to beginning bell training. If your dog doesn't respond to repetition training or hasn't established a routine, he may be too young or inexperienced to respond to bell training. If he has, but sometimes cannot get your attention in time to avoid an accident, he might be a great candidate. You should be armed with plenty of treats for this training, but always bear in mind that additional treats are additional calories, so don't give your pal an enormous biscuit each time he performs. Choose small or mini treats for this step. Place the bell in or near where it will be located permanently. Your training will be ineffective if your dog has to search for the bell once the steps are learned. If you have other bells in the house, such as on cat toys, you might want to remove them until your dog associates a specific bell sound with the request to go outdoors. *Remove the bell from its permanent location and show it to your dog. Using a command such as "touch," or "bell," show the dog the bell by placing it in front of him a few inches from his face. His natural response will be to smell the bell. Allow him to do so. *Once he touches the bell, say, "yes," or "good dog," to reinforce his positive response and give him a treat. Repeat this step several times using the command you've establish to encourage him to touch the bell. *As your dog continues to touch the bell in its present position, move it slightly farther away, repeat the command, and treat him when he touches the bell. *When your dog is comfortable with the above steps, encourage him to touch the bell without the vocal command. Point to the bell. When your dog touches it, use the positive reinforcement command and give him a treat. When you're confident your dog understands how to activate the bell, place the bell where it will be permanently located and show it to your dog. Repeat all of the above steps with the bell in place and open the door immediately after giving the reinforcement command. Most dogs require repetition, so don't fret if it takes several days for your dog to learn the bell-ringing technique. Each time your dog rings the bell, immediately open the door to allow him to go outside. If he lingers or begins to play, bring him inside to reinforce that bell ringing is for bathroom time, not play-time. When it comes time for outdoor play, you're in charge.